Here is an example of one of my websites which I have been optimising for several years now. The website is actually owned by my auntie and uncle, however I designed and I still manage it. They are both journalist and live in Cannes, Cote d'Azur region of France. They have lived there for about 7 years and absolutely love the place. They have dedicated a lot of time and effort in putting this very informative website together, it has over 123 pages! And I'd be surprised if you can find anything that they have not included within this website that Cannes has to offer (and if you can email them not me). It was therefore a very good website for me to try out my optimisation skills on. obviously this is based on the summer months, peak season and during the Cannes Film Festival. In fact the website is so successful that people think it is the Cannes's Official website! 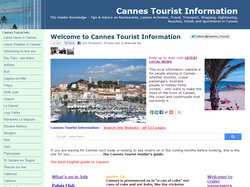 Here is a look at the search results for Cannes Tourist Information Cote d'Azur France. As you will see we have quite a few at No.1 and many many more keywords in the first page. Many of these keywords beat much larger websites such as trip advisor, wiki-travel, lonely planet, virtual tourist, gofrance etc. This website proves that good and original site content will always prevail. At it's best Cannes Cote d'Azur gets over 1,100 - up to 2,500 hits a day, which is during the Summer months and and whilst the Cannes Film Festival is on it can top over 2,000 regularly. On average it gets around 50,000 hits a month and during May to August this can double nearly 100,000. So if you are planning on visiting Cannes or the Cote d'Azur region Check it Out! So in Short you are looking at over one hundred keyword searches at No.1 in Google. Apologies it is so long..................! I could go on and show you everything that is positioned in the first page, but I think you get the picture. 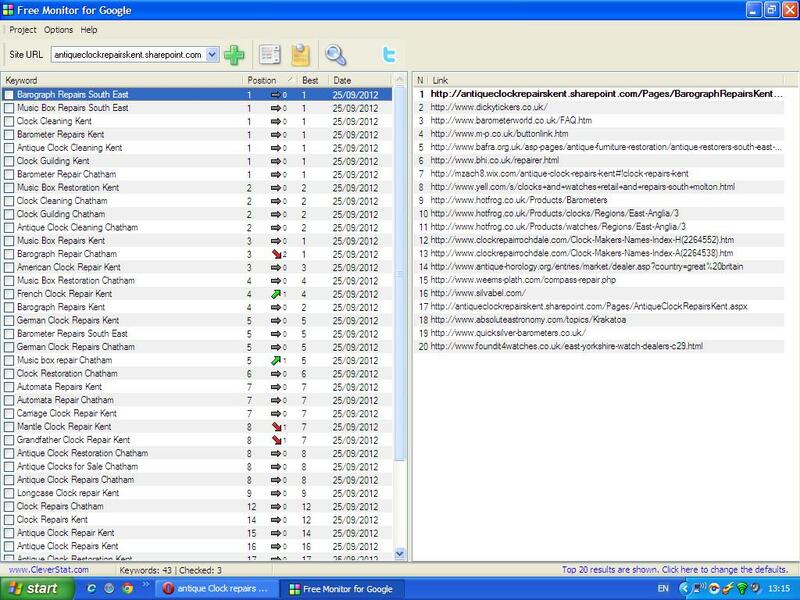 This is a good example of a customer who had an existing website that was not featuring highly or at all in many of the search engines and therefore required optimising. In addition I set up for the customer several microsites and a blog site which I linked back to his original website. And as I did not access to his site I gave some simple infromation to the original web designers to help the whole process. You will also notice in the search results http://antiqueclockrepairs.blogspot.com a blogsite that links to the main website. And another site created in WIX, another free website builder. For most of these Keywords Shirley Antiques and associated websites are occupying many of the places within the first page of Google. Meaning a greater chance of visitors clicking on this business. These websites are achieving No.1 position for all of the required keywords across several websites. Antique Clock Repairs Site, Created in Office 365 using a free domain name.